IT decision makers in nearly every industry are already evaluating wearable technology for adoption by their company, and adoption has already started in earnest for those with employees working in technician roles, according to a new survey from Apx Labs Inc.
Ninety-three per cent of IT and business decision makers surveyed were exploring the use of wearables in their company and 87 per cent said that wearables will have significant impact across their industry in the next five years. Herndon, Va.-based Apx Labs, a wearable technology solutions provider, commissioned Zogby Analytics to conduct a survey of 201 business and IT decision makers in the U.S. There was a skew towards large enterprises with 5,000 or more employees, and the minimum company size was 500 employees. The survey points to strong growth in wearables over the past 12 months, with smart glasses and smart watches seeing the most growth out of all devices in the category. 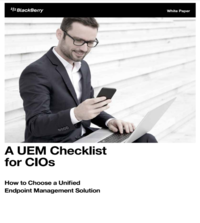 Most organizations are using more than one device. While 15 per cent of respondents had adopted just one device (in most cases the Apple Watch), half of respondents are researching or using three or more different devices. About one-third of companies are using smart glasses and smart watches as a pair. Companies are also carefully considering their options when it comes to wearables vendors. Most companies are pursuing a multi-vendor evaluation when buying smart glasses, but Google is dominating the space with Glass being used by 87 per cent of respondents. Apple was the leader in the watch-using companies, used by 80 per cent of them, but Samsung followed right behind at 79 per cent. These trends match what Apx Labs is seeing with its own customers, Ballard says. Google Glass remains the best-selling wearable for their business, despite being pulled out of the consumer market last year. Smart glasses are just very good at solving specific problems for workers that have their hands full while they work, such as those in manufacturing or field repair. “If they hit an anomaly, they can call an expert and they can coach them through what’s going on,” he says. One industry that’s lagging on wearables adoption is retail. Of all the scenarios being considered for wearables, leading use-cases included inspection and quality insurance (49 per cent), manufacturing assembly (48 per cent), and operations and production (46 per cent). Scenarios such as customer service (34 per cent) and sales (32 per cent) saw less interest. “Any time you put a screen between you and a customer, you create an mipersonal experience and that’s exactly what retail is trying to avoid,” Ballard says. 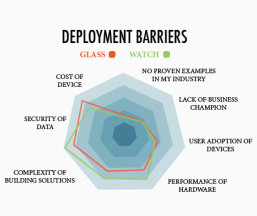 Across all industries, concerns around security and cost are creating the barriers to more wearables adoption. While 70 per cent of decision makers in companies with more than 5,000 employees put emphasis on security as the main barrier to adopting smart glasses, 67 per cent of mid-size companies pointed to cost as their main barrier. When it came to smart watches, security was the top barrier to adoption for companies of all sizes. The survey results are considered accurate within 7.1 percentage points, 19 times out of 20.